Texas Senate District 10 (Tarrant County) is the only Senate district regularly considered a toss-up by politicos. That fact alone makes it one of the most important races this November for both Republicans and Democrats. With the recent flipping of Senate District 19 (Bexar County and parts of West Texas) from Democrat to Republican by Pete Flores, the race for SD10 becomes even more important, as Republicans are on the verge of retaining their supermajority in the Senate. 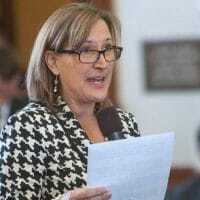 Currently, State Senator Konni Burton (R-Colleyville), a longtime conservative activist, small business owner, and adoptive mom of two, represents the district. She wrestled the seat away from Democrats in 2014 when her predecessor, Wendy Davis, left the seat for her failed gubernatorial campaign against Greg Abbott. Burton now faces Beverly Powell, a Democrat seeking to flip the seat back to blue in the general election. Beverly Powell is a real estate and residential development businesswoman. She easily won the Democrat primary netting 61.6% of the vote against Euless research scientist, Allison Campolo. Burton is widely considered one of the most conservative members of the Texas Senate. By representing Tarrant County (including Fort Worth), she gives Republicans a rare urban stronghold. For Democrats, knocking off Burton would accomplish several objectives: 1) The Senate would lose one of its most conservative members; 2) Senate Republicans’ chance of retaining their supermajority would dwindle; 3) Republicans would lose an urban district; and 4) Lt. Gov. Patrick‘s ability to pass conservative legislation would be limited. Thus, Powell’s campaign is a top priority for Democrats across the state. Both candidates have raised nearly the same amount during the 2018 election cycle, which is one reason why this race ranks near the top many politicos’ watch lists. As the incumbent, Burton boasts a much larger cash-on-hand figure than Powell, $528,445.88 to $140,749.70, but Powell’s percentage of in-district donations has far outpaced Burton’s. In raw numbers, Powell has garnered 239 more in-district donors than Burton. Usually, in-district donations equal greater voter enthusiasm — one more reason SD 10 is considered one to watch. The battle between craft breweries and beer distributors is becoming increasingly heated in the Capitol. During the 85th Legislative Session HB3287 was passed, which forces breweries producing 225,000 barrels or more of beer per year to pay a fee to beer distributors even if the beer is being served in their own taproom. Craft breweries decried the legislation as over-regulation and crony-capitalism. The beer distributors claimed the legislation was necessary to prevent big beer companies who purchase craft breweries from avoiding distribution fees. Burton sided with craft breweries, claiming the legislation ran counter to free-market principles. Interestingly enough, The Beer Alliance of Texas, a trade association representing beer distributors, still donated $3,000 to Burton’s campaign. But not all distributors are happy, Val LaMantia Peisen, COO of L&F Distributors, became one of Powell’s largest donors with a $10,000 gift. Liberal Republican PACs Texas Association of Realtors and Texas Medical Association have both contributed to Burton’s reelection, $10,000 and $7,000 respectively. And while it’s not uncommon for these groups to support incumbents, it is rare for them to strongly back someone as conservative as Burton. Based on her voting record, Burton is no friend to either group, yet they support her. So what gives? One possible explanation is pressure from Lt. Governor Dan Patrick. Patrick has made it clear how important Burton’s race is to him, and these groups are well aware that during the legislative session no one wields more power than Patrick. Could their support of Burton be a tactic to remain in Patrick’s good graces? Time will tell. Texans across the state, especially those in the Metroplex and Houston, are likely familiar with personal injury lawyer Jim Adler (aka “The Texas Hammer”), as they’ve been inundated for decades with his late-night TV commercials and early morning radio ads. Adler, who does not reside in SD 10, contributed $1,000 to Powell’s campaign. Although not a large donation, Adler’s support for a candidate — or against an incumbent — across the state sends a loud message about what trial lawyers think of the SD 10 race.